Andy joined Elmwood Franklin in 2014 as our Head of School. A native of Buffalo, Andy came to EFS from The Woods Academy in Bethesda, Maryland where he was Assistant Head of School. Prior to that leadership position, he was an assistant headmaster and dean of students at the Washington Jesuit Academy in Washington, DC and a middle school teacher at Mater Dei School in Bethesda, Maryland. Andy holds a B.A. from LeMoyne College, an M.A. from The George Washington University, and an M.Ed. in Private School Leadership from the Klingenstein Center at Teacher's College, a part of Columbia University. 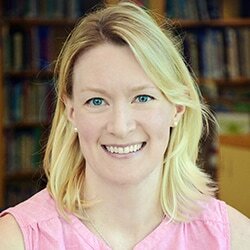 Annie joined Elmwood Franklin School in 2017 as our Head of Upper School. She cames to EFS with over 15 years of experience working in the field of education as a teacher and administrator. Most recently, Annie served as the Middle School Dean of Students at Nichols School, a position she held since 2004. A Buffalo native, Annie received a bachelor’s degree in Music Education from the State University of New York at Fredonia, a master's degree in Educational Psychology from University at Buffalo, and an M.Ed. in Private School Leadership from the Klingenstein Center at Teacher's College, a part of Columbia University. An alumna of EFS, Sarah joined the Elmwood Franklin team in 2010. After graduating in 1998 with a degree in elementary education from Bucknell University, Sarah started her career as an elementary educator, first teaching kindergarten at The Buckley School and then first and third grade at The Browning School. While teaching, Sarah continued her education, earning a master’s degree in elementary education from New York University. After teaching for ten years, Sarah took a year-long break to pursue another passion, cooking. This led her to London and Le Cordon Bleu, where Sarah completed a semester of training. Heading back across the Atlantic, Sarah attended The Klingenstein Center at Teacher’s College, a part of Columbia University, and earned a second master’s degree in the Private School Leadership Program. Elmwood Franklin School prepares children for success in life. By setting high standards for scholarship and character and providing a nurturing and supportive environment, Elmwood Franklin fosters the development of confident, independent, self-motivated learners with a strong sense of responsibility to self and community.